This year’s show lived up to expectations. Plenty of great looking games spread across history with quite a few non historical games. The Star Wars competition looked spectacular with all the space maps joined together. I was so impressed I forgot to take a photo! A good variety of traders with plenty of stock meant temptation but I mostly managed to resist. And an impressive bring and buy where I got a couple of bargains. 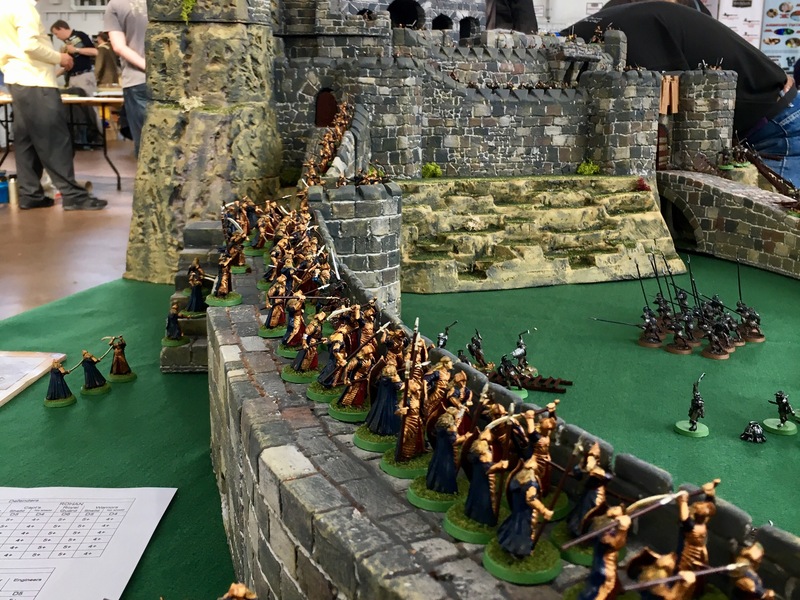 The Exmouth Imperial Wargames Club who run the show had a good looking siege of Helm’s Deep game. The fortress itself was very impressive with the stone beautifully painted. 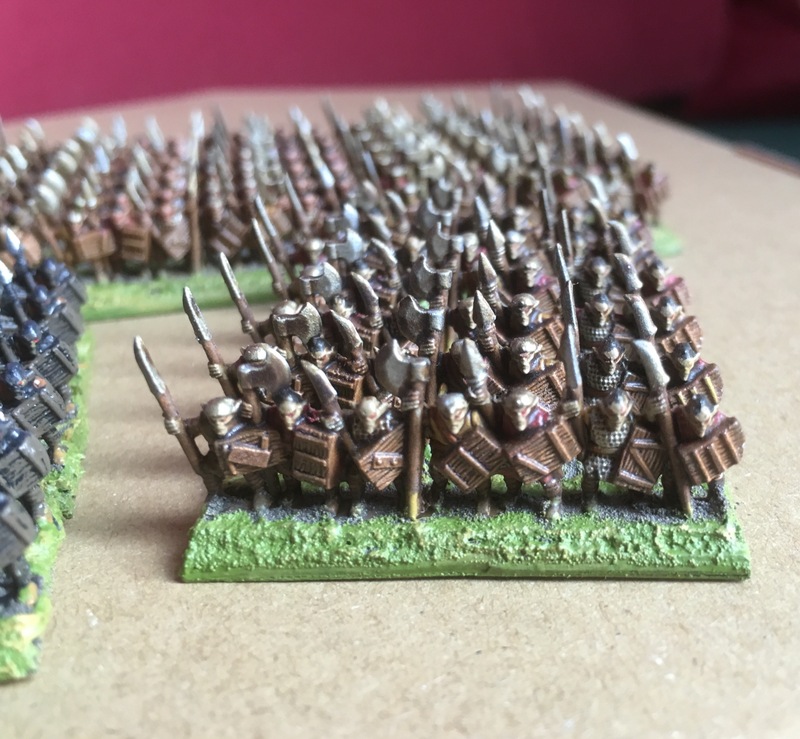 Talking of painting I was impressed to hear the elves had been painted for the game. 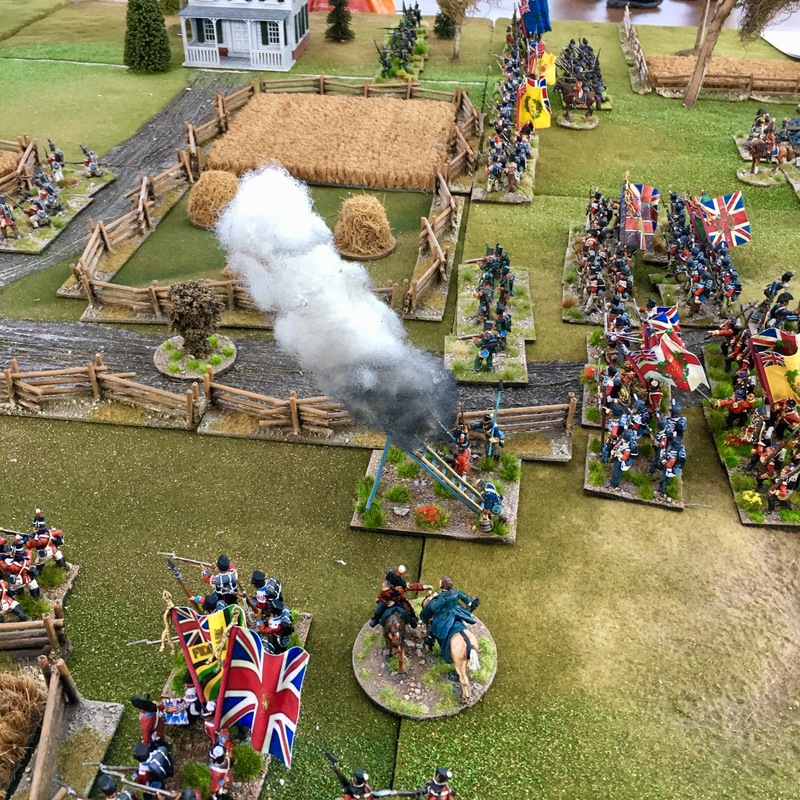 Another game that caught my eye was Graham Cookson’s War of 1812 game. The smoke effect on the rocket team looked most convincing! As usual the show was a great opportunity to catch up with people. I had my annual chat with Martin Goddard from Peter the Pig who seems to be making the Russian army of the Second World War on a 1:1 basis. I was interested to hear from Helion Books that Bicorne Miniatures are to release a set of figures depicting the Royalist Oxford Army. Good news for English Civil War collectors. Older gamers will recognise Warmaster as Games Workshop’s mass fantasy battle rules from 2000. BOFA stands for Battle of Five Armies which was the later Hobbit version. 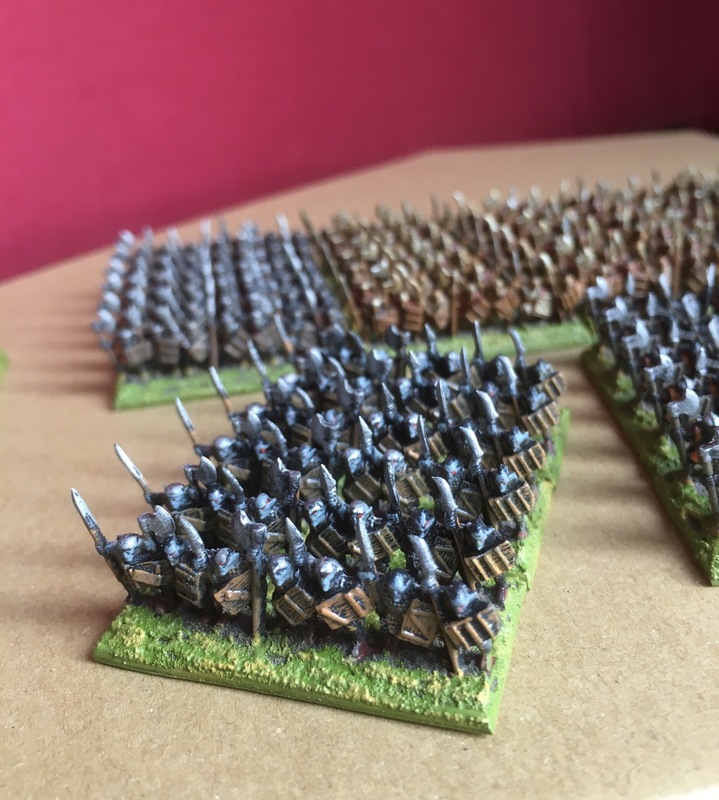 Both games use bases of 10mm metal or plastic figures based in elements on 20x40mm bases, with three such bases forming a unit. I was painting the goblins from the Battle of Five Armies box set. This produces eight units to make the goblin army. 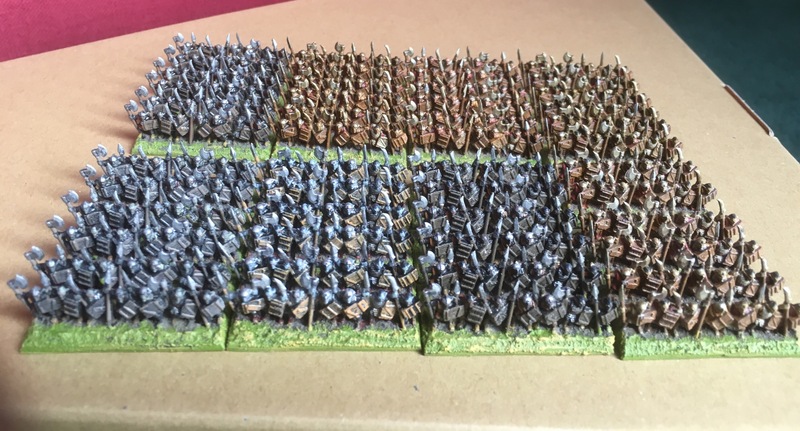 That’s a total of 336 (8 times 3 bases each with 14 goblins on) 1cm high goblins to paint! I wanted to get these painted quickly because of the number of them. 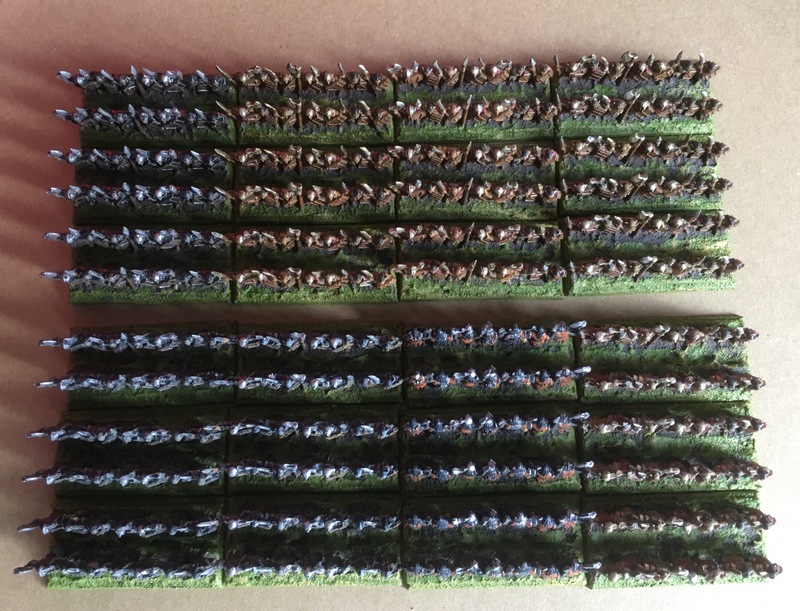 Plus I have another eight units to paint! I tried two techniques. First was the traditional black undercoat to provide dramatic shading and lining. This creates almost a cartoon effect and by dotting in glowing red eyes worked well. Second was using a coloured acrylic varnish produced by Ronseal for treating wood over bases colours. This is the same as the technique known as the “the dip”. Of the two I decided the starker black undercoat worked best. Especially when viewed from a distance as on the games table. And it seems quicker too.